The use of microcurrent facial toning is very acceptable for treating sports injuries, burns and wounds. It helps the body heal up to 350% faster than not having microcurrent therapy. In 1830, Dr. Carlos Matteucci found that the body sent out electrical charges when it was injured. And by the early 1900’s, Dr. Thomas Wing used microcurrent to treat patients with Bells Palsy and strokes. This discovery led to the creation of CACI, the Computer Aided Cosmetology Instrument. The CACI machine popularized the use of microcurrent technology in aesthetics. With over 20 years of research, the CACI machine isolated the low level of current. This tiny micro burst of current tones, lifts and re-educates muscles. Yes, a non-surgical face lift. The process of microcurrent facial toning is completely painless and safe. After only one treatment, you can visibly see increased muscle tone. The typical signs of aging including fine lines can be targeted while the individual muscles are lifted. Some clients even think it tightens pores, but it’s actually the lifting of the skin. No matter, the results are younger looking, healthier skin. 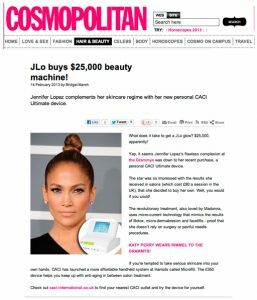 Jennifer Lopez knows microcurrent works! The human body has its own natural energy and current. Microcurrent (which means mild electrical) uses this low level electrical current (up to 640 microamperes) to re-educate the facial muscles. 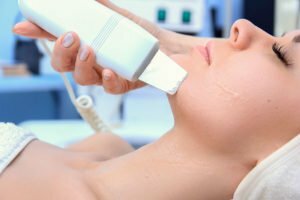 The electrical current used for this facial is almost the same as your own body’s bio-electrical field. The microcurrent facial works in harmony with the body. If you have skin with fine lines, wrinkles, decreased elasticity or sun damaged, muscle lifting treatment can restore a more youthful appearance. It will give the facial muscles and skin a “workout” that stimulates collagen and elastin. A microcurrent facial is a non-surgical face lift. Ultrasonic (sonophoresis) Microdermabrasion to exfoliate and prepare the skin. This gentle exfoliation improves the circulation in the skin. It is very gentle, good for all skin types and less aggressive than the old-fashion crystal microdermabrasion. Microcurrent lifting of over 32 muscles to lift, smooth, tighten and tone the skin. (even around the delicate eye area) A T-Prong works for the large muscles around the jawline, while smaller probes lift the more delicate muscles. This positioning of the probes re-educates and re-trains the muscles to hold the energy in their new position. The Wrinkle Comb (Red LED light) is then used to “rock the wrinkle” and further plump and soften specific areas such as crow’s feet and smile lines. Ultrasonic Infusion of peptides, vitamins, and serums at 4,000 times more effective absorption than manual application. Works on improving skin tissue e.g: Acne scarring, sun-damage, dry/dehydrated skin. Microcurrent facials, while completely non-invasive, will sculpt, tone, and tighten the skin. The re-education and toning of the facial muscles reduces the overall visual appearance of aging. The more treatments you have, the better the improvement in your skin, so a series of treatments is recommended for the maximum benefits. Book now or call +1-561-404-7670 for a reservation. WHAT WILL A SERIES OF MICROCURRENT FACIALS DO FOR YOU? As we grow older, muscles in our face because of facial expressions either get looser or tighter. Some muscles are hardly used (like around the jawline) and that can cause sagging. Other muscles and expressions lead to the lines that are formed by repeated use. Examples are the furrow or “elevens” and the smile lines. With the addition of overuse and underuse of muscles, the skin is also having a breakdown of collagen and elastin which contributes to facial aging. The Muscle Lifting Facial (aka Microcurrent Facial) takes about 1 hour for each treatment. 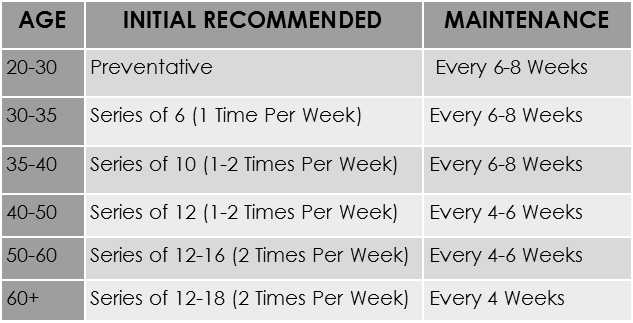 Most people will need at least a series of 10-12 sessions to see maximum benefit, but immediate results are seen with the first treatment. Treatments are recommended 1 to 3 times per week. According to this study conducted, “Consider of Micro-Current’s effect to variation of Facial Wrinkle trend, Randomized Clinical Trial Study”, treatment satisfaction was 70%. For our clients, one microcurrent treatment will deliver 2-3 days of lift, while a series of 10 to 12 treatments gives anywhere from 6 to 18 months of lift. The muscles maintains their position better and longer after each treatment. The number of sessions depends entirely on your skin condition and lifestyle. The effects build every time. The muscle will hold the new position longer. Typically clients will notice approximately a 5-7 year reduction in facial age. Other: Great for quick pick me up or special occasions as results last up to 2 days. Excellent for post-surgical facelifts for maintenance. Microcurrent really works for aging, as it’s popularity combines with other skin luminous treatments. The most popular right now is the MICRO-DERMA-ZEN which combines dermaplaning, ZEN nano technology and a hydrogel mask for the perfect non surgical face lift.